This guest post comes from my twenty-year-old cousin Mara Lewis, who spent the last week up in Maine with us. It’s about the challenge of building a relationship with a little boy she sees only a few times a year. I first saw Jay on Sunday morning a little after 9am. I had arrived with my mom in Maine at the house where my cousins grew up the night before, and was sad to learn that he’d gone to bed just before we’d arrived. When I awoke the next morning, my first thought was that Jay was probably already awake, too. I ran downstairs, only to learn that he’d left for the park down the street. I quietly ate my cereal and waited for his return. About an hour later, I heard Jay’s voice in the driveway. Then I saw him walk through the front door. I stepped out of my chair and ran to give him a hug, but he just hid his face behind Caroline’s legs. I tried to mask my disappointment, but inside I was crushed. I’d spent the last two months looking forward to seeing Jay again, and now here we were, reuniting with a denied hug. I wasn’t sure how much Jay would remember me. Six months ago, I’d spent two days with him in upstate New York for Christmas. Our time together then still felt so recent to me, and I convinced myself that it would feel that way to Jay as well. I moved past our unsatisfactory introduction and attempted to make Jay comfortable with me again. The whole family went out to the backyard, but my focus was on Jay. We picked blueberries, knocked around a plastic golf ball, and sat on a tree swing. Within minutes I’d won him back. He held my hand as he asked me which blueberries were ready to be eaten. 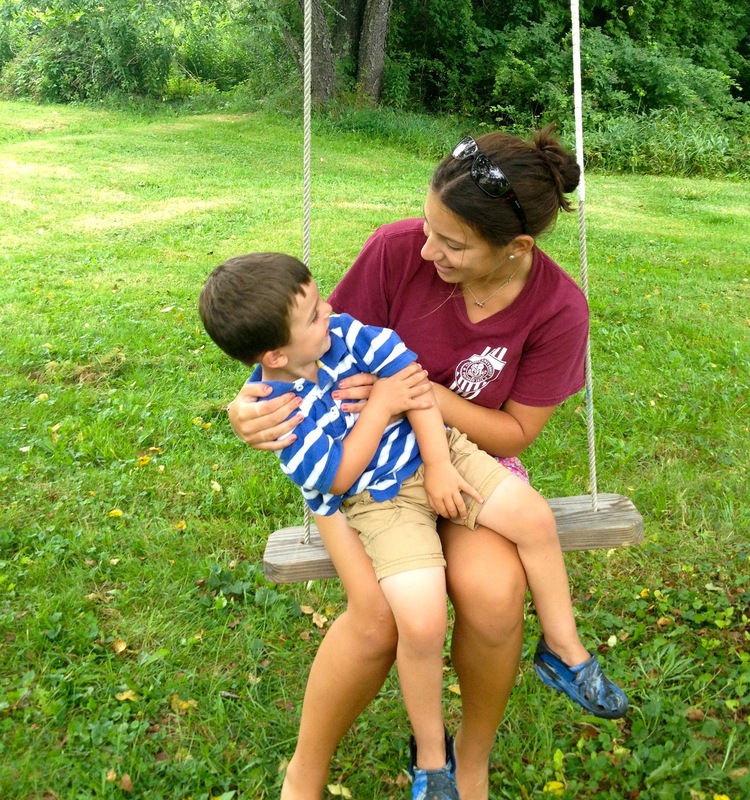 He let me hold him on the swing and let me tickle him to the ground. He developed a fascination with a game I had on my iPhone called Draw Something, and painted me pictures of elaborate ice cream sundaes. It was hard to believe that only 30 minutes earlier Jay had viewed me as a stranger. Jay was filled with questions. He asked why about everything, whether or not it had an explanation. One afternoon, Jay, Caroline, and I had planned to go sailing, but were forced back at the last minute by storm clouds on the horizon. As we walked home from the harbor, hand in hand, Jay asked, in his typical construction, “What means storm?” I explained a storm is when it rains and thunders, and he asked why those things were going to happen. I did the best I could to answer him. “Because the weather changes and sometimes it’s nice out and other times it’s not.” Insufficient. “Why?” he asked again. “Because there are dark clouds in the sky and those clouds are filled with rain that will soon start to come down.” When he asked “why,” again, I had nothing left to tell him. “That’s just the way it is,” Caroline and I said in unison. After only three days of our vacation, I felt closer than ever with Jay—so much so that I started to miss him almost as soon as I said goodnight to him each evening. And while I imagine this closeness meant more to me than it did to him, I think he felt it too. One night just after Caroline had put Jay and Wally to bed, I was in the kitchen doing dishes. All of a sudden, I heard a voice at the top of the stairs. I knew that Caroline probably wanted him asleep, but I couldn’t resist. I left the dirty dishes on the counter and went to join Jay on the stairs. We talked and laughed together, and I realized that I was in fact genuinely enjoying the company of a three-year-old. We talked about our favorite parts of the day and what our dreams were going to be, a bedtime tradition that Jay keeps with Caroline and Kevin. I told Jay I was leaving in the morning, and he gave me a big hug. The day after I’d gotten home to New York, I called the house in Maine to say hi to my mom, who was still there (I’d had to leave early because of work obligations). My mom came on the line and in the background I heard Jay running and talking as exuberantly as ever. “He wants to say hi to you,” my mom told me. “Put him on the phone!” I replied eagerly. “Hi Mara. I miss you,” he said. My face lit up and I couldn’t help but smile. Although this was just a day after I’d left, it gave me hope that when I run to hug him at Thanksgiving, he’ll run to hug me back. This entry was posted in Stories & Reflections, Uncategorized by Kevin Hartnett. Bookmark the permalink. I’ll bet Jay hugs you at Thanksgiving, Mara. It might be twenty or thirty minutes after he arrives, but he will. What a great post! Thanks for sharing your visit with Jay, Mara.